Test the horse-power of your Harley-Davidson®, and receive a read-out for confirmation of your motor’s performance. Located at our Launceston dealership. A Dyno machine is an essential tool for tuning fuel injected Harley-Davidson® motorcycles. The Dyno measures horsepower and torque, as well as exact air/fuel ratio on every run through the air/fuel ratio monitor. This takes the guesswork out of fuelling adjustments. The air/fuel ratio graph shows a rich/lean condition at each RPM during the dyno run. The Dyno’s Load Control software provides our technicians with the ability to control vehicle RPM or speed at any throttle opening. Fuel map modifications can then be made by the technician to improve power, torque, and economy. Want to see what your Motorcycles power is? we do Power Runs starting from $80. Want a full tune? Call our service department on 0363444524 and get a quote today. • Dynojet’s Load Control System uses the latest in eddy current power absorption technology. • Closed-loop control of Speed or RPM. • Vehicles tested at full or partial throttle. • Inertia Dynamometer Chassis with standard wheel base up to 84 inches. • Measures up to 750 horsepower. • Primary Wire Inductive tachometer pickup. One of the most asked questions we currently get is what we recommend for tuning modified bikes now that Super Tuner is discontinued. There are a lot of products on the market ranging from the very basic to very complex and some that are best left to an experienced or professional operator. Screamin Eagle Super Pro Tuner had everything you needed for any modifications up to the point of forced induction. Super tuner has a collection of modifiable factory written “base maps” for different exhaust, air cleaner and engine components to suit all HD Delphi injection systems from 2001 on. 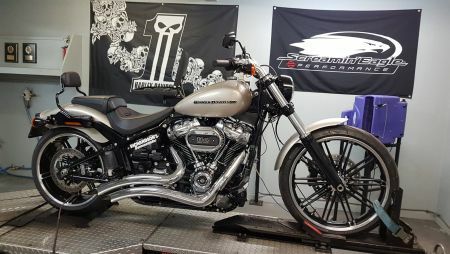 One of the major advantages of super tuner is that it is a genuine product that was developed by Harley-Davidson’s Screamin’ Eagle performance department. Another advantage was that it is a removable flash tuner which rewrites the tuning files of the OEM ECM and, once the changes have been made, the unit is removed from the bike leaving only the original hardware. Aftermarket tuners range from mediocre to very good and in some cases, extra components or modules have to be purchased in addition to the basic tuner to get the full range of functions advertised. A couple of popular tuners in the aftermarket are Vance & Hines Fuel Pack 3 and PowerVision from Dynojet. Fuel pack 3 is a plug in unit that connects between the OEM wiring harness and ECM requiring extra space to be found on the bike to fit. The files on the ECM remain stock and the tuner changes the output signals to change how the bike runs. PowerVision works in the same fashion as Super Tuner and rewrites the OEM file and once tuning is complete the unit is disconnected from the bike. The main advantage with PowerVision is that the bike owner only need purchase a tuning licence and not the whole PowerVision unit, thus reducing the cost. Since the discontinuation of Super Tuner, Richardson’s Harley-Davidson has along with many other authorised HD dealers chosen PowerVision due to many factors including ease of use, in-depth software, tech support and price. We encourage our customers to discuss their tuning needs with our experienced parts and service departments. Please read our article on super tuners below. You have just bought your new bike and have been told if you want to change pipes and air cleaner you must re-tune your bike to take advantage of the increase in air flow into the engine and exhaust. This will give you added performance, greater throttle response and believe it or not better fuel economy. The simplicity of upgrading your motorcycles carburetor(s) to compensate for changing engine components is a thing of the past for late model Harley-Davidson® Motorcycles. All bikes in the line-up since 2007 are now fitted with electronic fuel injection (EFI) as standard equipment. Much to the disappointment of many home and professional mechanics, they find themselves lost when it comes to making the changes required to improve the performance of their bikes. EFI just doesn’t adapt itself to the easy modifications that are possible with carburetors. Riders who were comfortable making jetting changes on their carburetor don’t even know where to start when it comes to their EFI system. surprisingly simple once you understand. You’ll find that you actually have more options for changes and better control of the air/fuel mixture with these systems than the venerable carburettor. The end result of all of this is that your engine will produce better power, provide crisp throttle response and even get improved economy. When you are trying to get the most from your engine, these benefits sound pretty good. Why modify the fuel system? Any changes in engine components are likely to require a change in the fuel map of your EFI system. The very nature of EFI and its ability to precisely provide the engine with the exact fuel needed is the reason that minor change in components may require changes in the fuel map. While it is a minor regression to EFI basics, I’ll remind you that the EFI computes the exact amount of fuel required for a specific engine RPM and load on the engine. If you are one of the many motorcyclist’s that make changes to the exhaust system, air filter, camshaft(s) or other engine components, you’ll need to find a way to alter the fuel map. As you modify your engine, the amount of air that can enter each cylinder is changed. When your upgrades are working properly, they require more fuel. This increase in air into the cylinders (Volumetric Efficiency) is the reason to add more fuel. If fuel map changes were not made, you would end up with a lean running engine, which could lead to engine damage. There are many ways to alter the fuel curve of your EFI system. We are going to look at a few of these in a little more detail and explain how they work. We will also try to point out some of the advantages and disadvantages for each method. While each of the upgrades does alter the amount of fuel the engine gets, many of the common upgrades never really change the fuel map in the Electronic Control Unit (ECU). This type of upgrade is a downloaded fuel map into your factory ECU to improve the performance of your bike. This is not common practice in Australia as the calibrations are designed for US models and are unable to be altered. This option is not recommended. Piggy Back Controllers connect into the OEM wiring harness to make changes to the fuel map. These devices alter the sensor signal from your engine and “fooling” your factory ECU into providing a different amount of fuel than the real engine conditions warrant. The simplest example of this is that if the factory ECU is told the engine temperature is 30 degrees cooler than it really is, the ECU is going to lengthen the time the fuel injectors are open and provide a richer fuel mixture. It’s actually a simple, but effective way to create new fuel maps. You create an adjusted fuel map in the piggy back system software and it is smart enough to change what the factory ECU senses. The downside of this upgrade is that you never really change the true fuel map that is in the factory ECU. Piggy Back controllers can also directly extend the time the fuel injectors open if they are tapped into the injector wiring. These “pulse extenders” know what RPM engine is running at and the current length of time the fuel injectors are open. Software packages like Harley’s SE Pro Super Tuner allow you make any change you want to the EFI ECU. You are actually making changes to the internal fuel maps for the EFI. It also gives you control over the ignition and knock sensor. This is the only viable upgrade if you are building a race engine or an above average street engine. The downside to this software is the level of sophistication the user needs in order to take full advantage of all its capabilities. The average rider or mechanic is unlikely to fully understand how to properly use this software package. Our factory trained technicians use this system in the dealership, and it’s the only factory backed EFI upgrade system available. There are a couple of companies that make EFI replacement ECUs. These ECU’s replace the factory ECU and provide their own software to control fuel mapping. The advantages of these aftermarket ECU’s is that they may be more sophisticated or have more capabilities than the OEM ECU. Case in point is the Magnetti-Marelli unit originally used on HD’s. This unit had limited upgrade capabilities and didn’t lend itself well to performance engines. In some cases, these replacement ECU’s and the management software packages that go with them are similar in price to the SE Pro Super Tuner software. The disadvantage of units like these is the fact that it is a complete replacement for your factory ECU. These are essentially a second ECU that acts completely independent of the factory ECU, even though it might be controlling the same fuel injectors. These types of upgrades take advantage of the fact that the injectors really don’t care where the instructions come from to put more fuel into the engine. This type of upgrade can only add fuel to the engine; it is not capable of reducing the fuel amount. For race engines or unusual engine configurations (NOS, Forced Induction) this allows a lot of flexibility in building an engine. Multiple sets of injectors can be controlled to compensate for situations where a lot of extra fuel is required. The disadvantage of units like this is that they are pretty much for special purpose racing or over the edge street engines. You are pretty much on your own with something like this, but this is probably not going to be a problem since your engine configuration is probably a one off design. This system is not commonly seen in Australia. There is always a group of riders that want the least expensive way to increase the performance of their vehicles. By understanding how EFI works, there are a few ways that you could alter the fuel mapping. When you make these types of changes, you are on your own. The types of upgrades that are commonly seen are replacing the engine temperature sensor with a variable resistor; increase the fuel pressure or installing larger injectors. While there are other upgrades that fall into this class of upgrade, we aren’t going to cover them in this article. The DIY upgrade is not recommended. As you can see, there are quite a few ways that you can alter the fuel map of your EFI system. The table below should provide you with the information to make a decision on the best way to upgrade you bike after looking at our “Upgrades Summary” table. The components you can use with your engine are usually limited to specific parts produced by the manufacturer of the bike. Any deviation from the listed components may cause a situation where the EFI mapping is not correct. Not suitable for Australian delivery bikes. The Power Commander is able to change the factory AFR by altering sensor signals to the OEM ECU. This relatively simple strategy allows a great deal of flexibility when it comes to creating better fuel maps for modified engines. These packages allow you to compensate for a wide variety of engine components. The OEM fuel map is never changed. All the PowerCommander does is “fool” the factory ECU into altering the amount of fuel the engine gets. Creating custom fuel maps requires a personal computer, and a certain amount of knowledge of EFI and PowerCommander software. This unit is subject to vibration and weather and is prone to failure. Not recommended. The TFI can be best described as a pulse extender. It allows the fuel injectors to stay open longer, thus providing more fuel to the engine. The TFI does not require a personal computer or any special equipment to tune the engine. All you need is a screwdriver to adjust 4 variable resistors. Anyone who is familiar with tuning carburetors will feel comfortable tuning the TFI. The simplicity of the TFI is also a disadvantage. Its ability to alter the fuel curve is limited to richening the OEM fuel curve. Not recommended. Engine Management Software allows you to modify all operating parameters in the ECU. In most modern EFI systems, the ECU controls the fuel and the ignition. The ability to alter fuel curves, ignition curves, rev limiters and other engine parameters is the ultimate for fine tuning a performance engine. These packages tend to be very complex. In many cases the EMS packages may have some base maps combinations predefined to help the user. But like the Chip Upgrades, these base maps assume that your components match their list of parts. Despite these issues, SE Pro Super Tuner Engine Management Software is the best way to upgrade an existing OEM ECU. Devices like the Power Commander and TFI will never be able to give the required control over the EFI and Ignition systems. Ultimately the best value for money package available. Since December 2017 the SE Pro Super Tuner has been discontinued and is no longer available. As you can see all systems have their advantages and disadvantages. For those of you who on a SE Super Tuner Pro module, don't panic you can still use the super tuner to tune your bike.